Sponsored Research is a major strength of a Institution. Adequate research infrastructure facilities are essential to conduct both fundamental and applied research in thrust areas of societal needs. The state-of-the-art facilities can be created with the help of funds from major funding agencies such as DST, DBT, CSIR, DRDO, MoIT, MoEF, DAE-BRNS, etc. With the support of such funds it shall be possible to procure the latest tools and machineries for research purpose. These facilities are responsible for transforming several research outputs into new technology. The sponsoring agencies shall be State and Central Government Departments, private companies and international organizations. 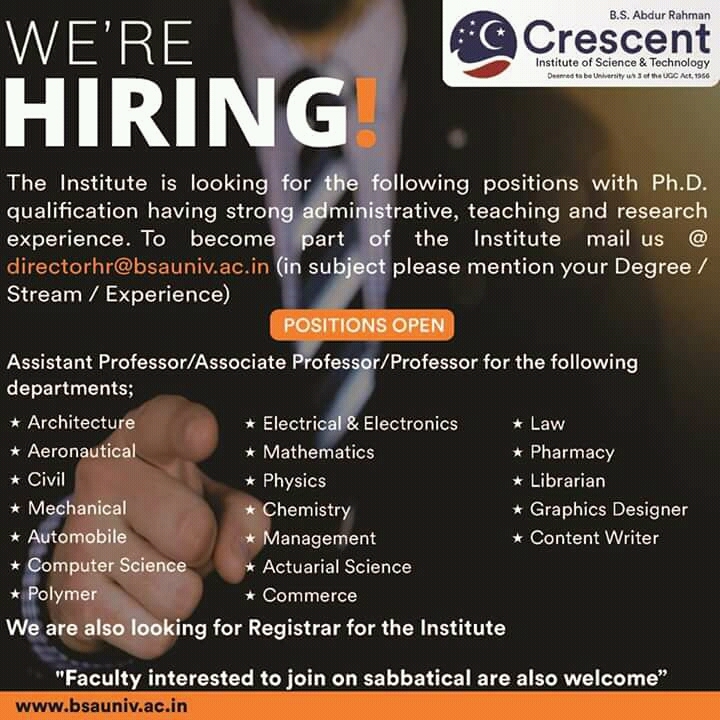 Realizing the importance, a separate Centre for Sponsored Research and Consultancy has been created in B.S.Abdur Rahman Crescent Institute of Science and Technology. The present Director of the Centre is Dr. D.Easwaramoorthy. This centre shall be responsible for the promotion of sponsored research, industrial consultancy and entrepreneurship development. The centre will ensure involvement of faculty members in the activities of sponsored research, consultancy and Institution-Industry interactions. Encourage faculty to write project proposals in thrust areas of both pure and applied research with the objective of creating new knowledge/ developing new technology. The centre shall act as a catalyst to create state-of-the-art facilities through funded projects in the Institution to do research in cutting edge technology. Conduct workshops/ invited lectures on recent themes for sponsored projects by inviting experts from the funding agencies. Promote Institution- partnership through industry visits, in-plant training in industries for students and faculty members and consultancy work. Develop and promote entrepreneurs among students through training programmes and incubation of their innovative ideas. The following programmes were organized to motivate and facilitate the faculty members of the Institution. Invited lecture on “ Opportunities in Naval Research Board and other DRDO Organisations for funded projects “ was given on 18th April 2009 by Cdr Suresh Kumar Thakur, Deputy Director , Naval Research Board ( Also Joint Director Naval R & D ) , DRDO HQ, NewDelhi. He talked about the thrust areas of interaction in Hydrodynamics, Ocean Environment and Oceanography, Sonar and Signal behavior, Materials, Scientific computing, Marine Systems etc by NRB with academic institutions and discussed broad areas in Naval Research. 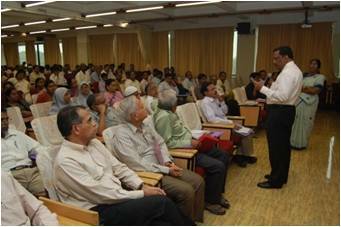 Interactive session was arranged with Dr E Srinivasan, Ex Director, NRB on 8th May 2009 with all the faculty members to discuss on the areas of research for getting funds from NRB. 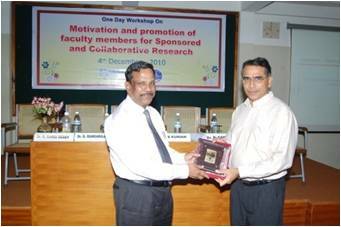 Organized One day workshop on “Motivation & Promotion of faculty members for Sponsored and Collaborative Research” on 4th December 2010 . 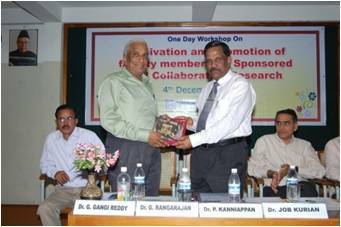 Dr.T.Rangarajan (Retd.Prof. 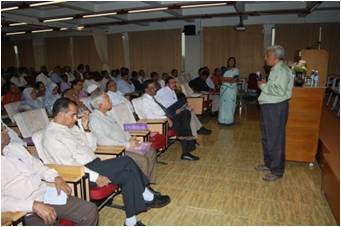 of Physics, IIT Madras), Dr.Job Kurian, Dean, IC & SR, IIT Madras, & Dr. G. Gangi Reddy, MD, TBI, University of Madras, Chennai delivered lectures to motivate our faculty members in sponsored and collaborative research.